With ever-changing federal and state legislative 1099 regulatory requirements, any organization that is not knowledgeable and the staff and business areas not prepared to comply with complex regulations could face significant financial risk and the possibility that you may be required to make a public disclosure of the risk. Any person who has responsibility for 1099 and state reporting is required to be up to date on all current regulations. The penalties and risks associated with non-compliance are onerous, and the burden is on you and your organization - not the IRS - to see that you are educated about regulatory updates. Ignorance of the law leaves you and your company exposed to costly penalties and legal fees. Accurate payment reporting is a critical function in AP, and earning a certification in this area of accounts payable demonstrates to your employer that you are dedicated to achieving 100% compliance. Employees who have earned the CPRS designation can play a key role in ensuring accurate reporting and fine avoidance - improving the bottom line and increasing your value to the organization. 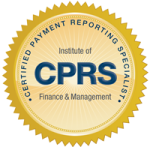 You will leave the course prepared and ready to take the Certified Payment Reporting Specialist (CPRS) certification exam. The exam can be taken immediately upon course completion or at a time that's more convenient for you (must be completed within one year of purchase). Includes: six-hour online training class (just updated for 2017! ); certification exam (3 attempts); online study guide (The Master Guide to Form 1099); and includes annual exam that is required to maintain certified status. Bi-annual Exam: Because the requirements and regulations for reporting change constantly IOFM will require you to pass an exam every two years. This will be required in order to maintain your certified CPRS status. Included in the $150 recertification fee will be the Master Guide to 1099 Compliance and access to the exam. These Fortune 500 Companies have staff certified through the IOFM/AP & P2P certification programs. Shouldn’t you be certified too? Wal-Mart • Bank of America Corp • Verizon Communications • American International Group • AmerisourceBergen • Boeing • Johnson & Johnson • MetLife • Freddie Mac • Sysco • FedEx • Aetna • Caterpillar • General Dynamics • Fannie Mae • Merck • Raytheon • Express Scripts • Northwestern Mutual • Emerson Electric • US Bancorp • Southern • L-3 Communications • Constellation Energy • Occidental Petroleum • Medtronic • American Electric Power • ConAgra Foods • KBR • Jabil Circuit • SAIC • Entergy • Textron • Sun Trust Banks • Mosaic • Progress Energy • Starbucks • Assurant • PPL • Quest Diagnostics • Ball • Reinsurance Group of America • Owens-Illinois • AutoZone • Dole Food • Thrivent Financial • McGraw-Hill • Amerigroup • Jarden • Western Union • Celanese • SPX • Agilent Technologies • General Cable • Alliant Techsystems, Inc.
Marianne Couch, JD, a co-founder of the Cokala Tax Group, is an advisor on U.S. federal and state tax information reporting compliance. She is a frequent lecturer at major tax conferences and the author of the Master Guide to Form 1099 Compliance and numerous published articles. She served for many years prior to 2007 as Research Director of Balance Consulting, and chaired special training and advisory services provided to large organizations and academic and nonprofit institutions. She is a former member of the IRS Information Reporting Program Advisory Committee (IRPAC), where she served as Chair of the IRPAC Subcommittee on Small Business and Self-Employed (SBSE) tax issues. Earlier, Marianne served as a Research Attorney for the Michigan Court of Appeals.